Pauline Johns has found her artistic niche in drawing brightly coloured creatures, which she creates using pro-marker pens. She usually works from her spare bedroom studio at her home on the Kapiti Coast but once a week, she goes to Pablos Art Studios in Wellington. At home she has to be careful where she puts her art because her mischievous cat likes chewing and ripping paper. She starts with a black thin line pen to outline her creature creation. Then she colours it in with pro-marker pens, which are like fancy felt-tip pens. "I enjoy creating characters that randomly pop into my brain and have been setting them in worlds from my imagination. 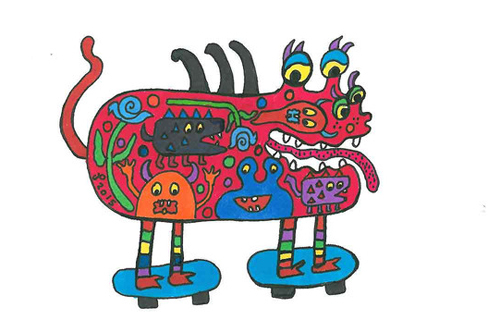 I started off with the idea of making creatures or monsters, part alien and part prehistoric dinosaur, mostly of goofy, stunned or happy dispositions," Pauline says. 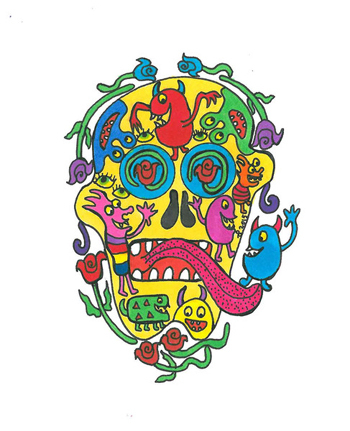 "Most of the time I start with doodling on paper using pro-markers and the colour stimulates the offbeat images in my mind and helps me to create my world of creatures." In 2009 Pauline began making creatures sculpted in clay and some were displayed in an exhibition called Crazy Critters at ROAR! Gallery. She made 30-40 of these and sold all of them for about $35-$45 each. She describes them as "slightly wacky and prehistoric". About four years ago she started drawing her coloured creatures and during 2012-2013 her creatures featured alongside other artists in the Secret Garden exhibition at Hastings City Art Gallery. People have been amused by Pauline's creations, they find them child-like and fun; kids like them too. Her characters are based on real or imaginary animals and she creates little characteristics and personalities as seen in Disney animations. At the moment, Pauline's favourite creature is shaped like a cucumber and it has its mouth open with lots of sharp teeth. It has big eyes with a couple of horns on its head. "I make them smile, I don't make them nasty, they are supposed to be comical." She has made cards featuring her creatures and also badges using the Pablos badge making machine. "My favourite art form is the type of drawing I'm doing now. It is work that I'm confident producing with the coloured pens that I love," Pauline says. Pauline was involved in art at school but stopped for a few years, only to return to it in her 20’s. She dabbled in sculpture, wood-work and painting for a few years. 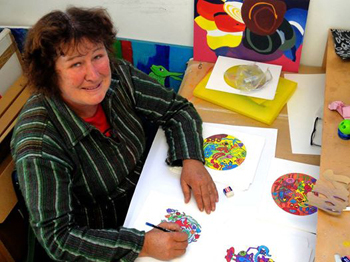 "Painting wasn't my passion and I used to struggle with it, so I was encouraged to try something else," Pauline says. Now having found her passion drawing creatures, the next step has been to make prints of her creations to sell in the gallery, rather than her originals. "I have sold a few works at the Pablos gallery and some to family. I'm lucky to have three really supportive sisters who encourage me with my art". With an interest in Pop Art, Pauline is also inspired by the work of her fellow artists. Sometimes a word or phrase from her tutors will spark a creative idea. "My goal is to expand my art and get it out there. I'd like to keep growing and see my art evolve," Pauline says. Original generation time 1.7221 seconds. Cache Loaded in: 0.0489 seconds.